First let’s go through a few details about our rainwater solutions. Configuration – Rainwater will be collected from all roof surfaces. This includes the roof surface of the two townhouses and the building for the two apartments. The water is to be stored in a common underground rainwater tank. The tank will probably be located under the driveway for easy access. There will be one pump. Uses – The water is to be used for non-potable uses: flushing the toilet, filling the washing machine and watering the garden. Size – Josh Byrne performed rainwater harvesting modelling for us using local daily rainfall data to ascertain the optimal size rainwater tank and roof catchment area required for effective rainwater harvesting. The modelling showed that the optimum size rainwater tank was 14,000L for the whole of the development. The Department of Health issued DRAFT Alternate Water Supply Guidelines – Stormwater and Rainwater in April 2009. This legislation covers stormwater and rainwater. It identifies different exposure risk levels. High risk is defined as “potential end uses with a high level of human contact, including (…) multi-unit dwellings, internal use”. In our configuration the rainwater tank is shared between the two townhouses and two apartments and therefore fell into the high risk category. What this means is that you need to comply with certain validation monitoring requirement and safeguards and controls. This includes recommended weekly monitoring for E.coli, BOD and SS, continous online monitoring for Turbidity, pH and Disinfection, monthly monitoring of Coliphages and 6 monthly monitoring for metals. You can imagine that this level of monitoring makes a shared rainwater solution for our size of development uneconomical and unmanagable. We were concerned that the legislation would prohibit similar size developments from incorporating a rainwater solution and decided to ask Josh Byrne to take up the issue on our behalf with the Department of Health. We submitted a report to the Department outlining the details of our solution, catchment characteristics, and control measures. Our request was that the Department of Health waive the monitoring and ongoing reporting requirements indicated in the draft 2009 Alternate Water Supply Guidelines – Stormwater and Rainwater. On 21 July 2011 we got the news that the Department of Health have given their approval for our system! 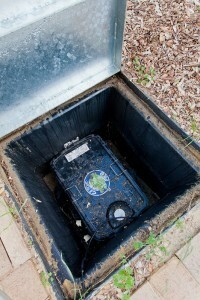 – that you comply with Australian Standards HB230-2008 Rainwater Tank Design and Installation Handbook. 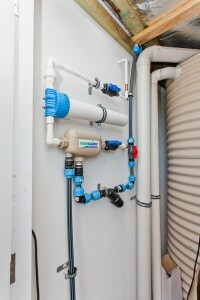 – that any above ground external tap connected to the rainwater system is signed in accordance with Australian Standard AS 3500.1 2003 Section 9 Non Drinking water services. We hope that our investment in pursuing this issue will result in many others benefiting from this decision. There is also an important place for the use of recycled water. The Department of Health has issued Guidelines for the Use of Recycled Water in Western Australia (Feb 2011). Again, for multi-unit dwellings, internal use and external surface irrigation is classed as high risk and again there are onerous monitoring and reporting requirements. It was a very difficult and resource intense process, with fortunately as outcome that the Department of Health decided that they had not objections to our proposed Greywater disbursement system as per the proposal and drawings that we had submitted. Note that the Guidelines for the Use of Recycled Water have since been updated. The latest version can be obtained from the Department of Health website. Whole of house rainwater for both townhouses – What this means – rainwater is used around the whole house when available. This includes all taps, toilets and showers/baths. This helps reduce the reliance on scheme water. 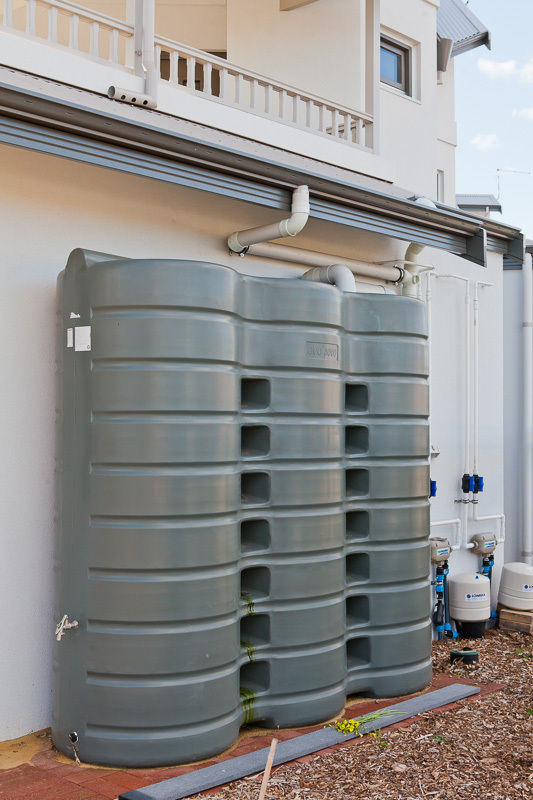 How it works – Both townhouses collect rainwater of their roofs into a 4,500L rainwater tank. When there is rainwater in the tank, this water will be used first. If the tank is empty, supply will automatically switch back to scheme water. The occupants of the home do not notice this changeover apart from an increase in chlorine in scheme water which you can smell. Water saving devices – all taps and toilets have been carefully selected based on their water rating. Bore – garden irrigation is from a bore owned and managed by the strata body (the owners of the complex). The use of bore water means that little to no scheme water is used to irrigate the garden. 21 July 2011: The Department of Health approved our shared rainwater system! that you comply with Australian Standards HB230-2008 Rainwater Tank Design and Installation Handbook.